There are currently 91,188 users on this website. Hmm, there is a Middle East company called "Warehouse of Games" with a similar logo. 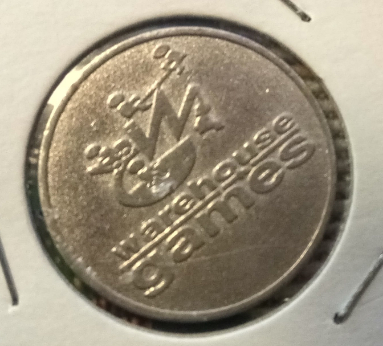 However, this company was started around 2004, but I'm thinking you have an old pinball or arcade token that would likely predate that company. If you could get a pic of the other side, it might be super-helpful. Ok sometimes the company that made the token puts its name in really tiny letters on one side. I was hoping that there might be something like this to help us.